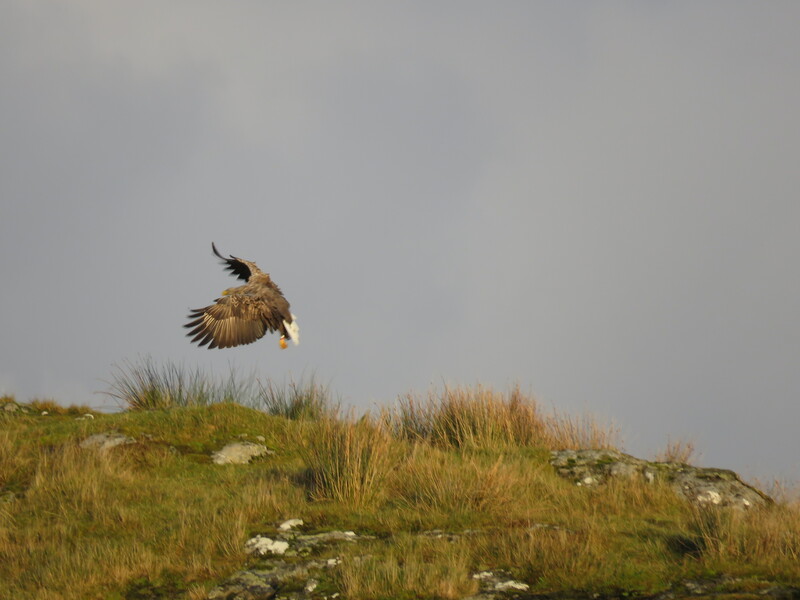 White-tailed eagles are long-lived birds, with an average adult life span of 21 years.. The oldest pair on the Isle of Mull ( thought to have been 37 years old) used to be regular visitors to the rocky outcrop in the field next to our B & B but sadly they died a couple of years ago. We now have a new pair making their presence known and we have witnessed recent courtship displays. The breeding season is characterised by frequent loud calling, especially by the male in the vicinity of the eyrie, sometimes taking the form of a duet between the pair. We are often notified of their arrival by them calling rather than seeing them. Eagles have a characteristic aerial courtship display which culminates in the pair locking claws mid-air, whirling earthwards in a series of spectacular cartwheels, and separating sometimes only a few feet above the ground or water and soaring upwards again. Both birds build the nest from twigs and branches, lined with rushes and grasses. They use the nest on and off for many years, and since new material is added every time, it can attain an enormous size. 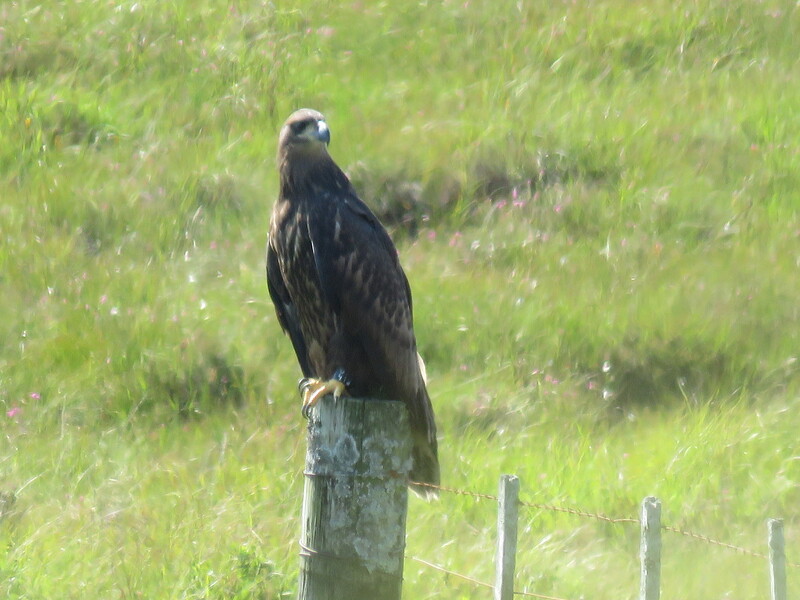 The new pair to the area nested in a tree across the fields from us in 2017 but moved further away to a lochan on the hill in 2018, however we are hopeful that the amount of recent activity we have witnessed and also seeing them in the same stand of trees that they nested in previously that they might move back into the area. The female lays two or three dull white eggs 2-5 days apart in March or April, and starts to incubate with the first egg for 38 days per egg. She does most of the incubation. The eggs hatch a few days apart. Although the chicks are quite tolerant of each other, there is competition between them, the older one being dominant. The female does most of the brooding and direct feeding of the young, but the male takes over now and then. He provides the female and the young with all food for the first three weeks after the chicks hatch, after which the female joins in hunting. The young feed themselves in the nest when they are 5-6 weeks old. They fledge at 10-11 weeks and remain close to the nest, dependent on their parents, for a further 5-6 weeks. We have watched the fledglings hanging about their parents territory until they get chased off. At one point there was a wee gang of 10 juveniles around Lochdon but they were eventually removed by the resident adults. Newly fledged Juvenile from 2017, max pull on my camera from the house to avoid disturbing it so not the best quality photo. Some text attributed to the RSPB website.